B U B B L E G A R M: Olive Oil & Brown Sugar Exfoliator! 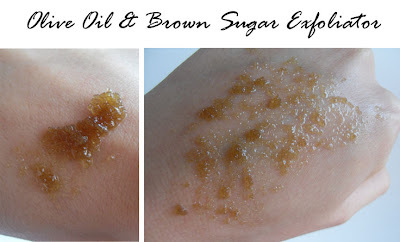 Olive Oil & Brown Sugar Exfoliator! Don't ever go and buy an exfoliator again! Make your own!!! I saw this natural tip on anaderol1977 natural skincare tips video and had to give it a try! All you have to do is mix olive oil with brown sugar until you get a desired paste - Voila. How quick and even better how natural? I have to say i'm in love with it, you can add more sugar if you want deeper exfoliation or less sugar if you prefer a gentle option. I made mine into quite a thick paste as I really wanted to shift those dead skin cells. I would recommend you do this once a week on your face and as often as you like on the body! A really yunmmy exfoliator! Will definitely try! Oh thanks for this will defo be trying it this week! How funny that I just posted about scrubs! I'm def gonna try this, thanks for the tip. wow, how moisturizing! i don't think this is ok for oily skin, though. probably for my rough patches on my elbow! thanks! I need a good exfoliator, gonna try this out! I will do this once I run out of my exfoliator, but...olive oil is quite expensive! Eek. Here, at least. :( But I'll have to see. Wasn't it sticky?? Thats what i use for scrub! all the time-except i use white suagr instead of brown-its the best i have come across-everything out there ruins my skin! I used to just do sugar with water...but the water melts the sugar too much...I guess this is the answer I was looking for! :) I'm gonna try this tonight...I bet it smells pretty good too. sounds like I need to give it a try too. Oh wow, looks easy to do and works great. I need to try this!! Thanks for the tip! That is a great tip.. I also put it in my hair as a mask.. and honestly i think i am in love with olive oil.. because my hair is so soft and shines like crazy..
as for the scrub.. i was actually thinking about.. i currently use honey+ brown sugar and that works just fine..
@sherona yay im so glad ur loving it, olive oil is AMAZING! you just saved me a trip to any cosmetic related stores... I will definitely try this experiment and see how well it works... i bet it's way healthier for your skin than any other exfoliator! Thanks for the tip. I'm supposed to be avoiding products that have a bunch of chemicals in them, which is really hard to find. I'll definitely give this a try. I'm using this DIY scrub for months now, & it's working so well! My skin is so softer & smooth! I'v just come across your blog and I already love it! Have you tried using honey and coarse sea salt as a scrub? It works best if you rub it on dry skin and then jump into a hot bath. It's sticky but its worth it as the honey continues to moisturise and the bath smells lovely!